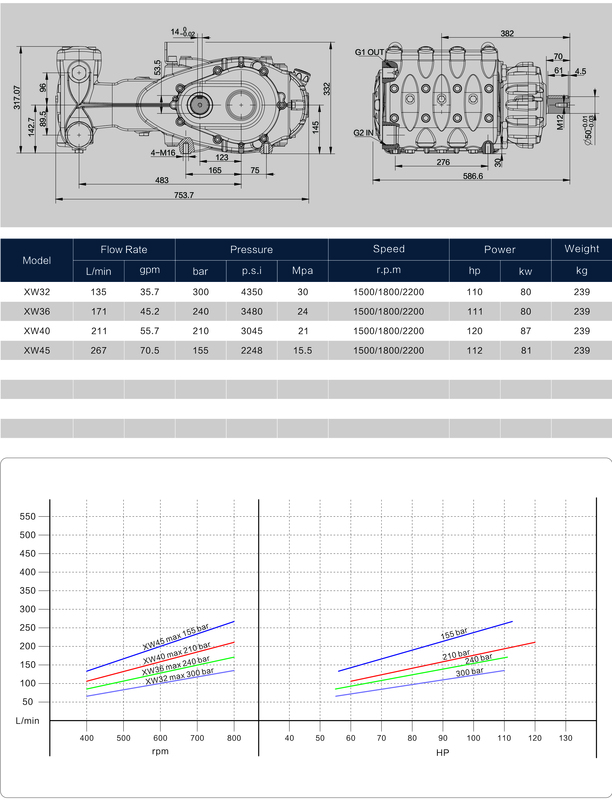 The Gearbox Drive Triplex Pressure Pump, integrated the up-dated technology of plunger pumps and skillful production process, becomes a reliable, popular pump with longer service life, minimal downtime and significantly reductive operational cost. The XW36 Triplex Plunger Pump with Gearbox has 6 different flow rate. The mounted gearbox is available in 3 ratios, 1500, 1800 and 2200 rpm. This Triplex Plunger Pump has vertically fitted suction/delivery valves, splash lubrication and includes efficient drain/priming valve kit. The Triplex Plunger Pumps with Gearbox are ideally suited for use in pressure Cleaning Equipment, street and drain jetting, heavy duty industrial systems, mining and drilling applications and so on. Symmetrical Crankcase Design, Easy " left to right" Conversion. Spheroidal Cast Iron Manifold, Nickel Plated Treatment. Nitrided, Hardened and Tempered Alloy Steel Crankshaft. 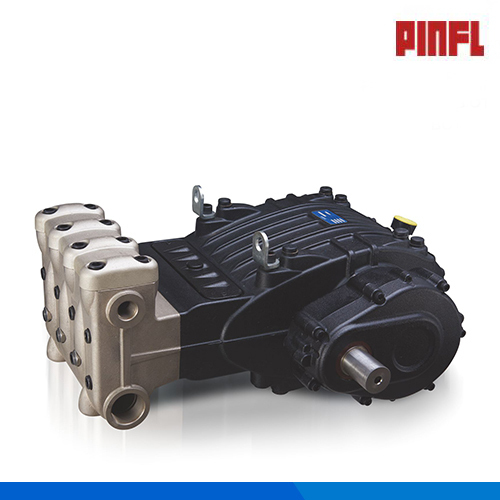 This Gearbox Drive Triplex Pressure Pump has a spheroidal cast iron manifold ( stainless steel manifold optional) and Cast Iron Crankcase, it has 3 versions at 1500, 1800, 2200 rpm, the maximum flow rate can reach 399 L/min, the inlet fluid temperature is up to 40 degree. The Gear Box Drive Triplex Plunger Pumps are ideally for high pressure cleaning, street and drain jetting, heavy duty industrial systems, mining and drilling applications. We are the trend-setter in China for this High Pressure Plunger Pump, we create & design and then introduce it to the consumers, in China, only a few companies have the ability to manufacture this pressure pump, with the unique & special feature, we proudly introduce them to you too. Compared to other overseas companies, we have great advantage in pricing, and presently, very few Chinese companies involve in this pump, we are the really right supplier or partner for you. It will be a profitable cooperation to work with us. We grasp all the technology of this high pressure plunger pump, and we utilize the highest quality materials & components, plus the gear reduction box, which makes this pressure pump durable & reliable. The technical support & assistance is available anytime, the quick-response will be effected. We will also find the most economical way to the spare parts requests. Looking for ideal Pinfl Triplex Plunger Pumps Manufacturer & supplier ? We have a wide selection at great prices to help you get creative. All the Pinfl Gear-box High Pressure Triplex Pump are quality guaranteed. We are China Origin Factory of Gear-box High Pressure Plunger Pump. If you have any question, please feel free to contact us.